There’s nothing like a database crash to make you appreciate automated blog backups. I spent the beginning of the week elbows deep in SQL tables and WordPress documentation, and am happy to report that I was able to bring the blog back to life without having to sell my soul to a UNIX geek. I made a survey of the Deep Storage Facility to figure out what I could turn into stews and heartier dishes before the weather got too warm. I found two rock-solid ribeye steaks, which I decided to cook with a new technique instead of my usual sous vide. Just as I was about to go with the method recommended by a national charcuterie champion, I saw this article featuring Nathan Myhrvold, author of Modernist Cuisine (MC). His method involves blowtorching the frozen steak to give it a crust, then cooking it in a 180°F oven for about an hour. It looked easy enough, but when I consulted volume 5 of MC I saw that the beef rib steak recipe featured a half dozen accompaniments. I had the ingredients for all of them, the recipes didn’t look too difficult, and if I spaced out the tasks over two days I could work at a leisurely pace. 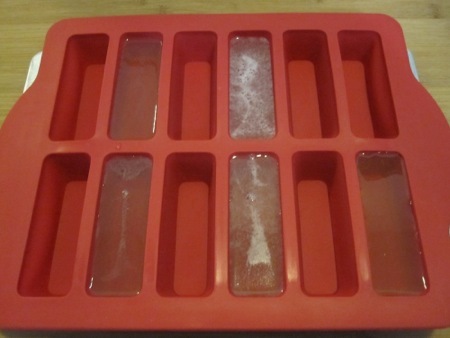 I boiled salt and agar in water until the gel hydrated, then poured the solution into a mold which set in the fridge. I cheated. I couldn’t bring myself to cook a pound and a half of aged beef and bromelain (an enzyme) sous vide, squeeze all of the juice out of the cooked meat, and then centrifuge the juice at 27,500g. Okay, I didn’t have a centrifuge, either. 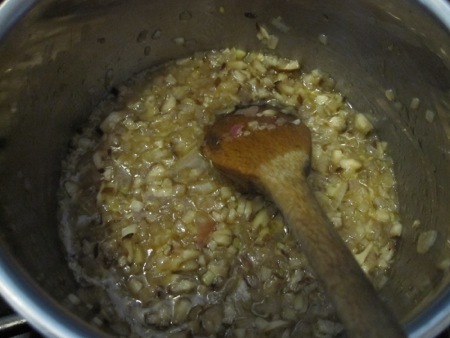 Instead, I reduced homemade beef stock by half and continued with the recipe, which called for the addition of xanthan gum, guar gum, and MSG. Again, I was supposed to centrifuge tomato puree to separate out the clear, tomato-flavored “water,” but this time I achieved the same results with a different method: gel clarification. 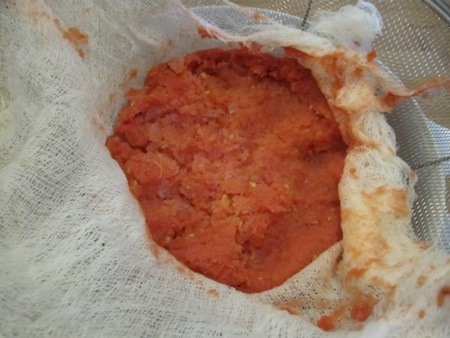 I combined the puree with gelatin, froze the mixture, then let it thaw in a cheesecloth-lined sieve. All for 40 grams of liquid, which was added to a sweat of shiitakes, shallots, and garlic, all cooked in rendered beef marrow (which I actually had at hand in the Belm Utility Research Kitchen). I added the mixture to some of the beef jus, thickened it with gelatin and xanthan, then corrected the seasoning with sherry vinegar, salt, and pepper. After reducing white beef stock, white wine, shallots, and white wine vinegar, I added heavy cream and low-acyl gellan. Day one’s work was completed, with the marmalade, jus, and mousseline components waiting in the fridge. The MC recipe for the potato purée that accompanies the steak includes potato juice passed though – you guessed it – a centrifuge, which I suppose is Myhrvold’s implementation of Maslow’s hammer. 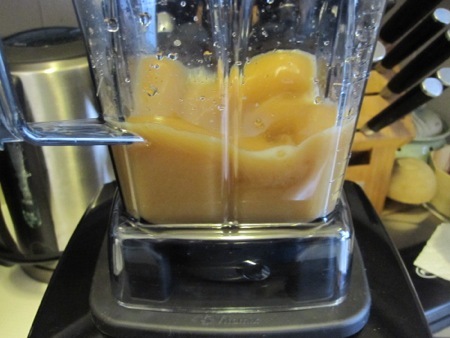 The Times article had a sidebar for pressure-cooked squash purée, which became my substitution (at least until I get that centrifuge that’s been on my xmas list for two years…). For the final push, I set the oven to 180°F, set up a water bath at 62°C, and put the pressure to the squash. I cooked four eggs in the water bath for about half an hour, then separated out the yolks, which I mixed with the stock/wine gel. 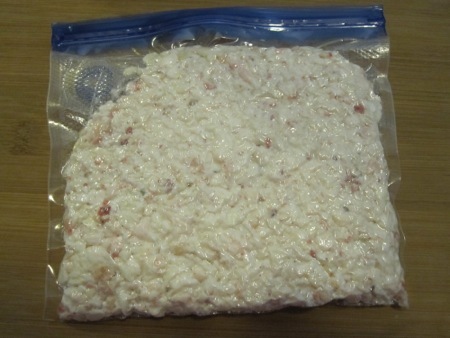 I vacuum sealed 200 grams of beef suet and cooked it in the water bath until it liquefied. 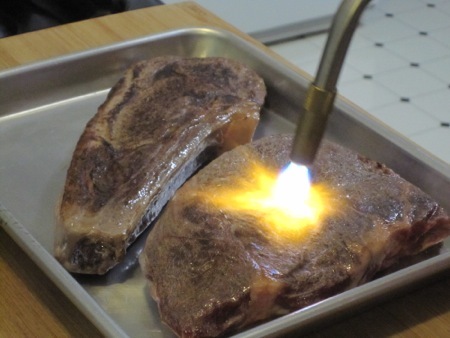 While things cooked in the bath, I took a blowtorch to the frozen steaks. I set the pan with the steaks in the oven, where it sat for 70 minutes. 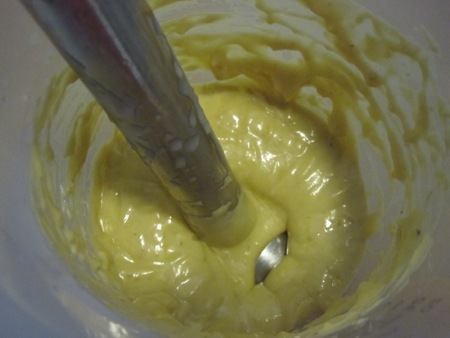 I blended the liquid beef fat into the egg fluid gel. I poured this mixture into a siphon, charged it with nitrous oxide, and let it stay warm in the water bath. 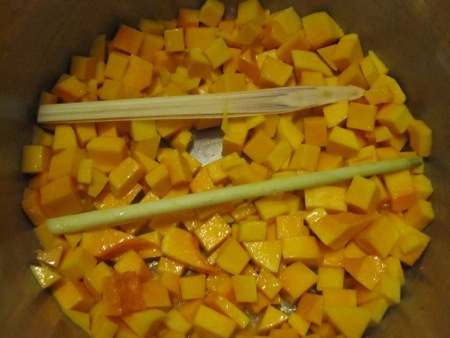 While the steaks finished cooking, I pureed the squash and warmed up the jus and shiitake marmalade. 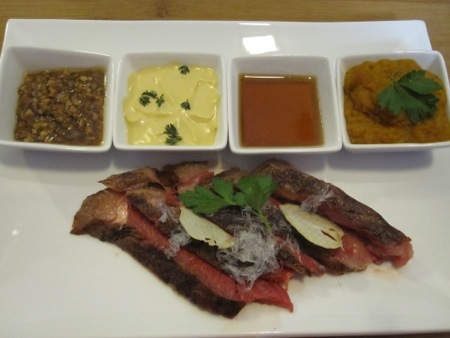 I sliced and plated the steak, added the garnishes to separate dishes (including foaming the suet mousseline), then finished with some of the grated salt gel and a few dehydrated garlic chips. The steak was as expected: perfectly rare out to the edges, with a caramelized crust. The salt gel, which came off my microplane grater looking like rice noodles, stayed solid even wen exposed to the heat of the steak. With the exception of the sweet squash puree (and I’ll never cook it any other way ever again), we treated the other garnishes like dipping sauces. The jus had a clean beef flavor, the marmalade provided the requisite deep onion/mushroom background, but the mousseline stole the show. 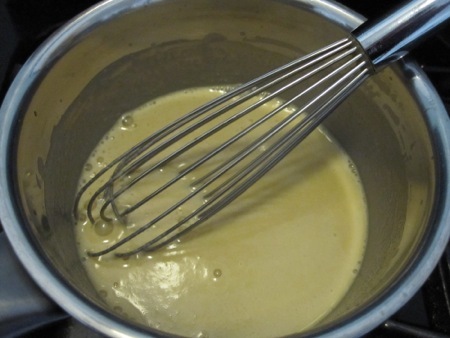 I should have realized what it would taste like as I was preparing it – wine and shallot reduction, egg yolks, added fat – I had made a sauce béarnaise without the tarragon. We all mopped that cup completely clean. The advantage to this steak cooking method was being able to use the water bath at one temperature and cook the steak at another, a problem easily solved with two sous vide rigs running simultaneously. I may not go through the trouble of making he jus and marmalade again, but that mousseline is a keeper.